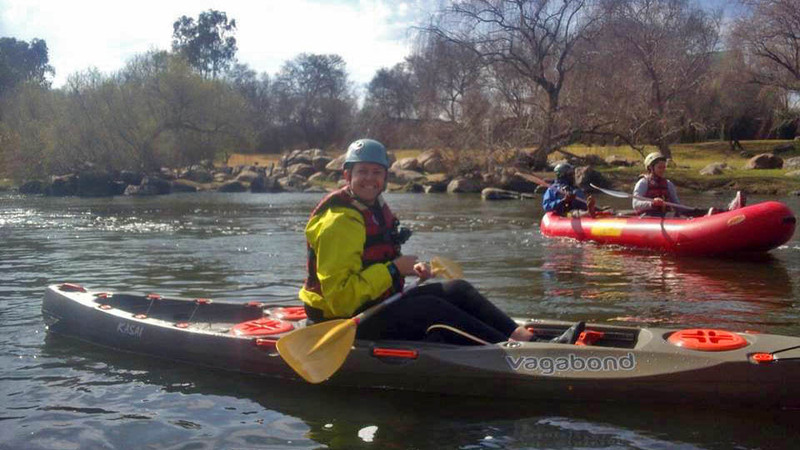 Lee-ann Simpson, a novice paddler, recently tripped an eight-kilometre section of the Vaal River near the town of Parys. While her four friends were paddling slow-but-very-forgiving two-person inflatable rafts provided by the operator, she decided to paddle our Kasai sit-on-top. With virtually no experience, Lee-ann was the perfect candidate to demonstrate the Kasai’s key features: stability, ease-of-use and responsiveness. This is her story. We are a group of girl-friends, away for the long weekend, looking to relax (rafting is not considered relaxing for some). It is August – it is still cold. The water on the section of Vaal River where we will be paddling has recently been badly polluted. We put all of these concerns aside and decided to go out and have fun. Lee-ann (left) with her friends. Before embarking on the trip, I mentioned to a family member that we were planning a river trip and she immediately hooked me up with a new Vagabond Kasai sit-on-top kayak. I must mention that I have limited experience of whitewater paddling, having only been on two paddling trips before. I expected that by using the Kasai for my ‘relaxing’ rafting trip, I would most likely end up wet, cold and frustrated. Still, I accepted the challenge and arrived at the launch with my Kasai in tow. To provide some perspective, I had been pretty vocal about my doubts of being able to successfully complete the trip paddling on my own. Nonetheless, my friends were very supportive of me choosing to paddle the Kasai instead of joining them in the inflatable two-person rafts (aka ‘crocs’) provided by the tour operator. The Kasai is marketed as a kayak for beginners but also for more experienced people wanting to have a bit of fun in the rapids. I figured I was at least one of these things, and therefore my chances were 50/50. My launch into the river was hair-raising. I slid down the bank with a chilly splash into the water. Luckily there were a few strong hands around to help steady me. Once I got my balance and started moving, nerves were replaced by excitement in anticipation of what would happen next. My beginner skills were immediately apparent. I had a few moments of wayward steering but never a worry with stability. The further we paddled, the better my steering and control became. We quickly came to our first rapid of the day, a fairly tame-looking beast with only a short stretch of bubbly water. The Kasai and I breezed through it and I earned a few ‘whoop whoop’ shouts from my friends. After this was a small drop of a about a meter high; this was also handled pretty well. 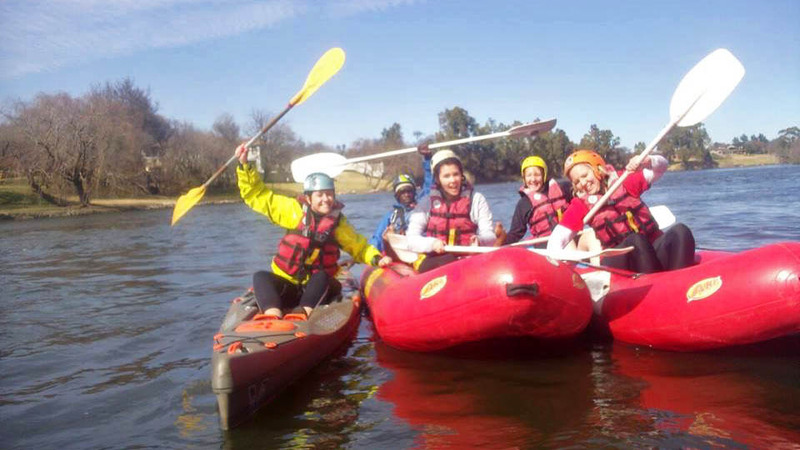 Luckily I had experienced something similar on a previous outing on the Klip River and I remembered a few of the tips on how to paddle through it. My confidence was high, my friends were proud, the sun was out, my feet were dry (unlike the ladies in the ‘croc’ whose feet were submerged in water) and we were making good progress. 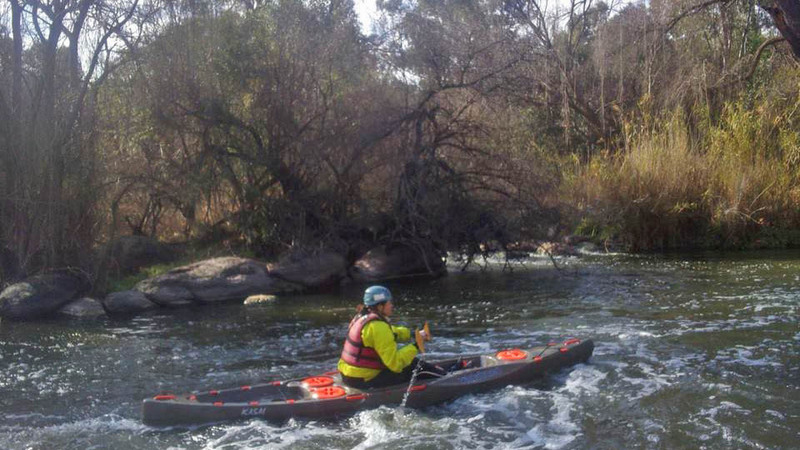 Lee-ann successfully runs a small rapid in the Kasai. Things got real very quickly though. The guide came up next to me and said that ‘Big Daddy’ was next and that I should hang back to hit the rapid last so that both guides would be in position to help “extract me”. The other guide gave me thumbs up and mentioned something about me having a 20% chance of making it through unscathed. Of course this made me more determined and I reckoned that my odds must be better than their prediction. The guides instructed me to keep to the right of the rapid, but not too far right – and then to aim for the right-hand side of the island below the rapid. From the top I could see none of this but I aimed the nose of my Kasai in that direction, built up some speed, steered right, kept paddling, went over, paddled part way through the rapid and then capsized. I estimate that I made it at least 20% of the way through Big Daddy, swimming the rest. Ironically, my guide was in just the right spot to haul me out of the freezing water (something about this says he has done this more than once! ), and we floated downriver to retrieve the Kasai. Strangely, I wanted to do it again. It was fun, it was challenging, it didn’t hurt, it wasn’t scary and I wanted to master this rapid. Sadly, that’s not how rafting trips work. Following the river’s flow, we pushed on. We soon came to ‘Suicide Mile’, a long, wide stretch of flatwater, with no rapids and lots of submerged rocks. While the girls were fighting to steer and paddle the ‘crocs’, I moved like a bullet. The Kasai came into its own, carving a neat path through the water, easily outpacing my friends and sitting rock steady. Bear in mind that I have no experience of flatwater paddling, boat control or any other skill that could have been helpful. I was having a ball. We ran another two small, bubbly rapids with ease and a few laughs, and then it was time for a long section with three decent-sized rapids one-after-the-other with no place to stop in between. This time the guides passed on no tips of which line to take and it was up to me to read the water. The guide paddled ahead and I stuck close behind him to try follow his line down. I made it through two of the three rapids without swims. The final part of the rapid was a bit tricky and that’s where I took my second swim of the day. The smile on the guide’s face told me that I had done well. Through the first two rapids he had even looked surprised to see me on his tail. Again, I was disappointed to swim but also driven to do it again (maybe in the summer). And with that, our trip was over. 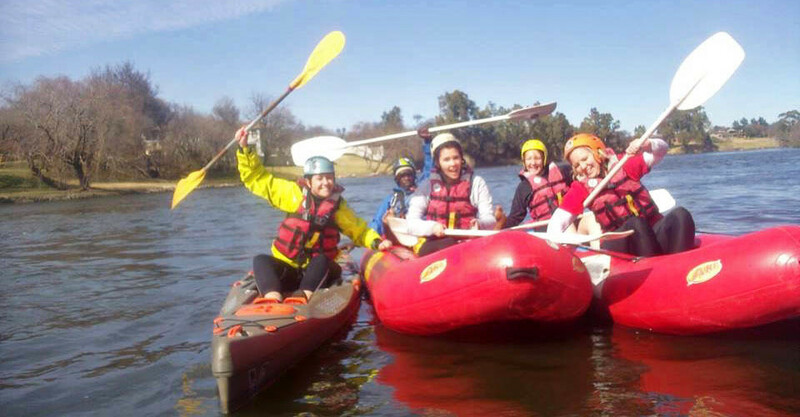 Two hours, eight kilometres, five girls, two guides, three inflatable rafts and one Vagabond Kasai. Lee-ann and a khaki Kasai. My overwhelming impression was one of having had a great time, despite the cold water and chilly weather. Would I do it again? Yes. Would I use the Kasai again? Yes! Do I need more experience? Probably, but I’ll only get this with more practice.